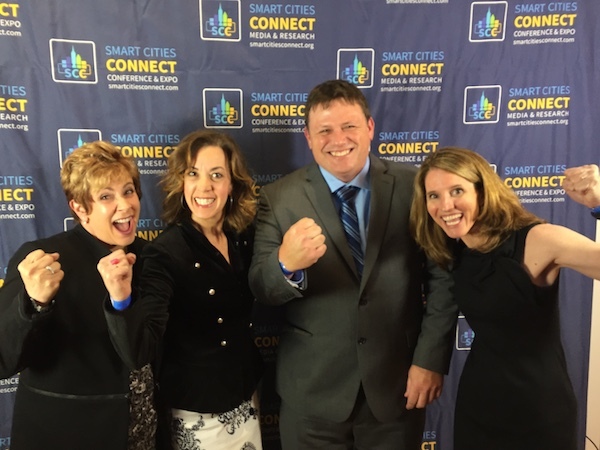 Recently, I had the pleasure of presenting how Cary envisions utilizing technology for Public Good at Interop with our amazing CIO, Nicole Raimundo, have I mentioned she was NC Public Sector CIO of the Year? Just sayin. We had the opportunity to brag a bit about Cary, as well as share our vision and journey – from our two different perspectives – of an elected and a CIO. It was great to hear from other CIOs and public servants about their own process, and allowed us all to learn from each other. We had a little video – to kick things off, and get people thinking. What are some of the technologies that are in use, or could be in use, to help us in our daily lives? What would that “Day in the Life” look like? 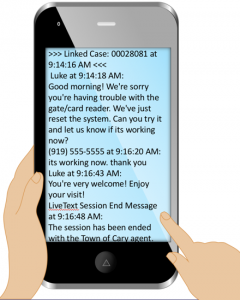 But one of the most exciting capabilities and one that gained a ton of interest from our Interop audience is a simple texting application. It’s called TXT311. And if you watched the above video, you might have seen a bit about it. 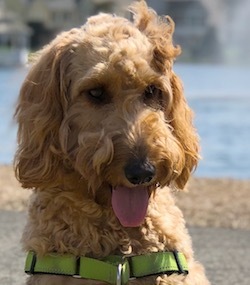 It’s Saturday, and you pack up the dog and the kids and head out to one of our great dog parks with a plan to wear out the dog, and the kids. Beautiful day – perfect weather, ready for fun. And, you get to the gate at the Dog Park – and it’s stuck. Your card won’t work. The gate won’t open. No one is around, and it’s a Saturday. I mean, c’mon. Look at these eyes —- how do you say “no” to that? Well, you don’t have to CALL anyone. 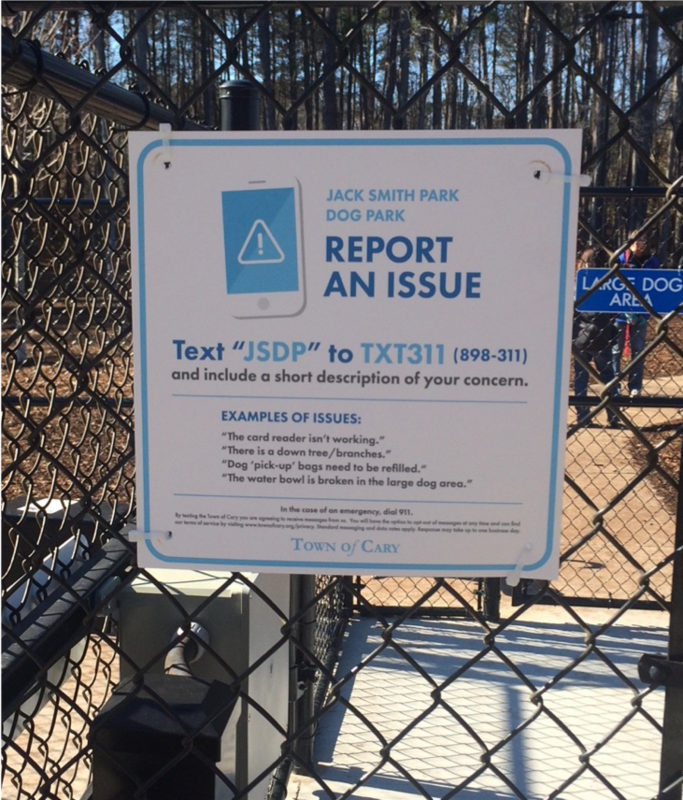 Hanging near the gate is this sign – directing you to use TXT311, to let Town of Cary staff know about an issue. So, you send out the text, and voila! You get a response, and Luke is on the other end, responding to your request. Our use of TXT311 as a tool for citizen communication, combined with our back end systems and people, allows us to be quicker to respond, all while making it easier for our citizens to get to the right person that can address the problem. Anyway, the first part is TXT – meaning text. The 2nd part is 311. What’s 311? 3-1-1 is a numeric code set aside in telephone systems for non-emergency connections for municipalities. Just like 9-1-1 is set aside for emergencies and first responders, and 6-1-1 is set aside for Telecommunication systems – 3-1-1 is set aside for cities. It’s also become the term now used for all city related non-emergency call systems and centers. Think of it like a hotline to your town, and you don’t have to remember the 919-460-xxxx number. The first 311 system was launched in 1996, and since then the term has been used to refer to a number of connections between citizens and their local governments. It’s also helped to drive more process improvements inside of government, because the focus continues to be on the citizen – and silos make it harder to respond quickly and efficiently. So, now you get it! TXT311 – it’s Cary’s first real use of the 311 term out in the wild, and it’s already helping our citizens. This is what Smart Cities is all about. To leverage innovative ideas, technology and people – all coming together to make Cary the remarkable place it is to live, work, own a business, raise a family —- and to play. At a dog park, if you want. Oh, and if you want to watch Councilmember Jennifer Robinson and I talk about this a bit more, check out our Cary Matters video, below. 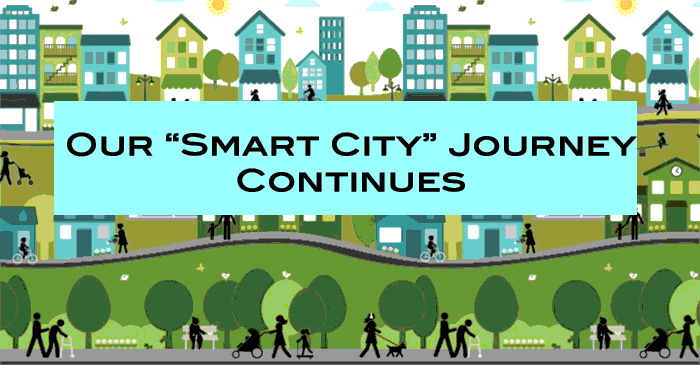 Great information on Cary’s Smart City initiatives.